AMAZONAS Magazine is conducting a simple survey of our readers to get an idea of how many tropical-fish keepers have had allergic reactions to bloodworm exposure. Click to take the quick survey. Move over, palytoxin, Mycobacterium, and a host of other zoonotic diseases; you’re not the only potential health risks in the aquarium hobby! Time to dive into a surprisingly prevalent health problem associated with bloodworms. You may not have paid much attention to your fish-food labels, but let this be a reminder to read them thoroughly. Bloodworms, the bright-red mature larval stages of chironomid flies, are true powerhouses as a fish feed. 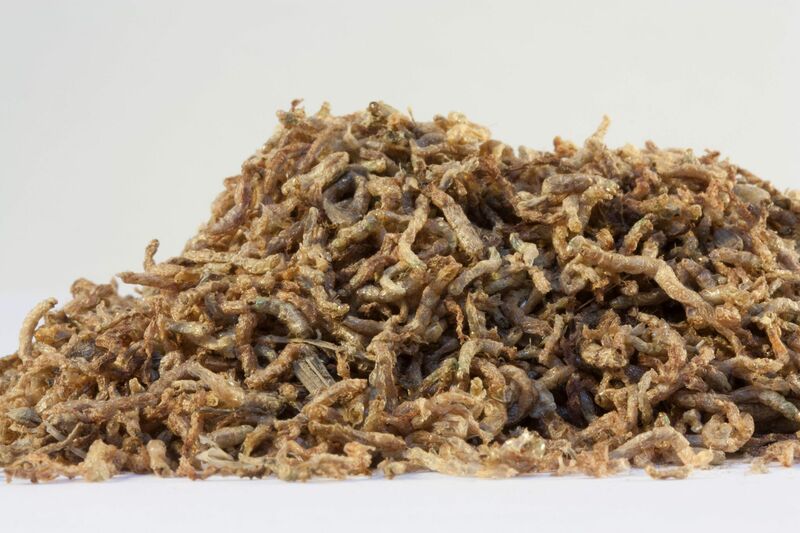 Whether frozen or freeze-dried, they can be used to lure many reluctant feeders to “take the bait.” But if you haven’t been paying attention, you might not have noticed the note on the label that reveals that bloodworms also offer up the potential for strong allergic reactions for some aquarists who use them. The science behind bloodworm allergies points to the hemoglobins that give bloodworms their trademark bright-red coloration. These hemoglobins, which are powerful oxygen scavengers, are what allow bloodworms to thrive in the oxygen-deprived bodies of water they call home, but they are also what triggers an allergic reaction in some people. One journal report suggests that hypersensitivity to bloodworm allergens exists in about 20% of people who are routinely exposed to them. Other studies reveal repeated connections between chironomid larvae and asthmatic reactions. 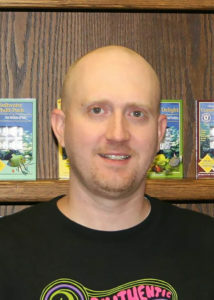 These reports are often tied to environmental factors outside of the aquarium world among people who are in proximity to large natural populations of these midges, including: studies in Japan and Spain finding significant rates of allergic reactions in asthmatic patients, or the case of the delayed onset of hypersensitivity in an environmental surveyor after 10 years of exposure. 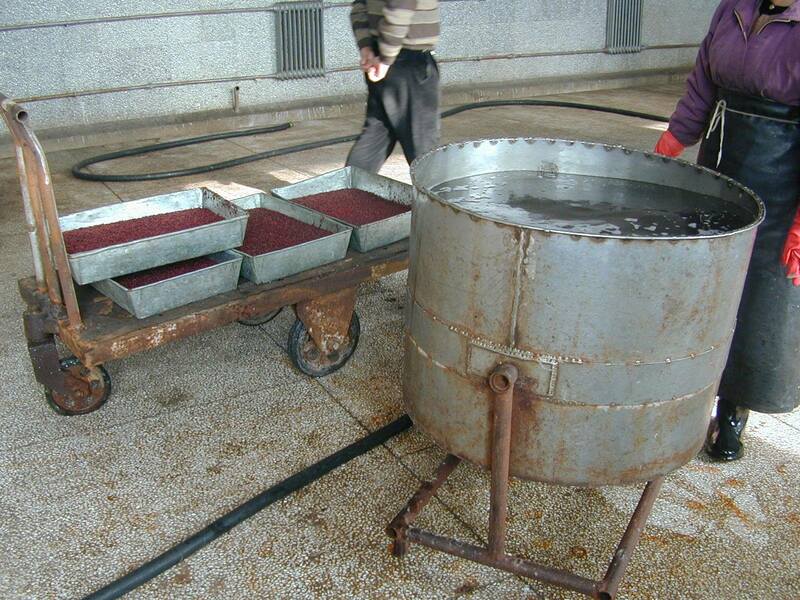 Preparation of bloodworms at a factory in China; note the skin protection on the worker at right. 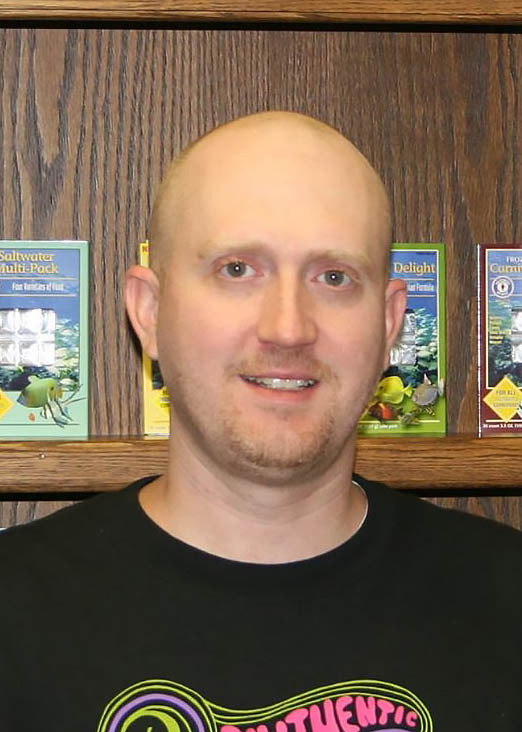 Jason Oneppo, salesman and head of research and development for San Francisco Bay Brand (a distributor of frozen and freeze-dried fish bloodworms) for the past 17 years, noted that his company is actively working on a revised bloodworm allergy document, to be published in the near future. 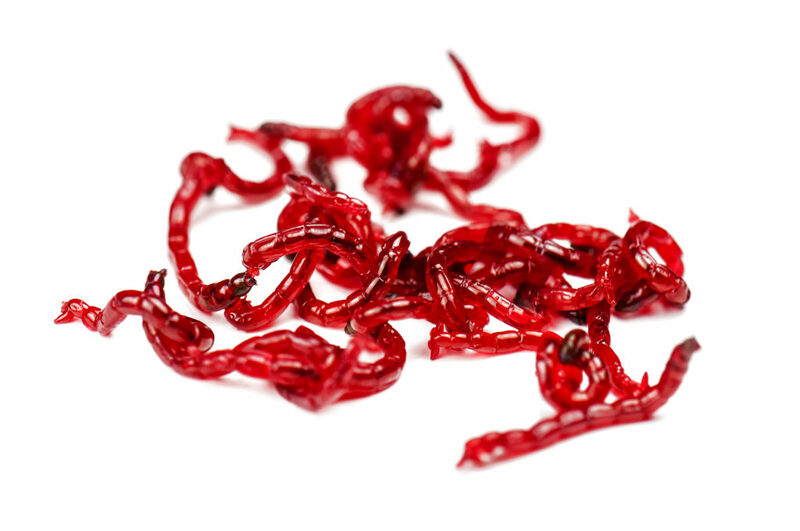 Freeze-dried bloodworms are a popular and highly effective aquarium fish food. Inhaled dust-sized particles from these products could cause a hypersensitive reaction. Image courtesy San Francisco Bay Brand. Multiple reports suggest that cross sensitivity could occur; in short, if you’re allergic to things like mites or cockroaches (which have similar allergens), you could have an increased risk of hypersensitivity to bloodworms. San Francisco Bay Brand’s draft report includes the following possible symptoms of allergic reactions: sneezing, skin rashes, runny nose, or itchy eyes. Additionally, more pronounced asthmatic reactions could occur. In all cases, should you experience any of these symptoms, it is strongly recommended that you discontinue feeding bloodworms. The idea of a bloodworm allergy may seem far-fetched; many aquarists have never even heard of it. But when I reached out to contacts and their friends, it quickly became apparent that this allergy is not rare, not by a long shot. Here is just one of many stories I received. One tiny misstep, and Derek Wheaton’s eye is in tremendous discomfort. Bloodworm allergies are a bit more prevalent than one might have thought, and they can range from a mild nuisance to rather scary, debilitating reactions. While we’re unaware of any deaths resulting from bloodworm exposure, anaphylactic shock is one of those things you perhaps don’t want to risk. Wheaton’s story is just one of several we received, but we’d like to hear from you as well! AMAZONAS Magazine is conducting a simple survey of our readers to get a larger sampling of data, which we will share in a future update. Whether you have a bloodworm allergy or not, your responses are very valuable. We invite you to participate in this 3-to-12–question survey. It will only take a minute or two of your time. is it possible to share this article ? I am thinking of some fish keeping groups on FaceBook , as this is important . Bloodworms make the skin on my hand itch. I have to wash my hands thoroughly after handling them to make sure I don’t get it in my eyes. Just discovered today that I am allergic to these buggers. I also have adverse reactions to midge bites, so I’m guessing therein lies the connection. 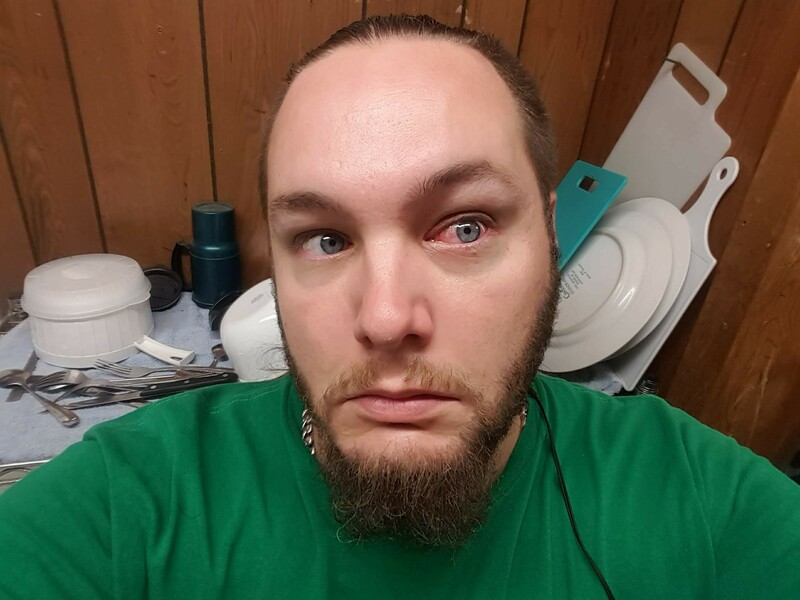 My eyes went red, swelled up and became intensely itchy, and my nose started running. I’ve never had a skin reaction, but I must have touched my face shortly after feeding bloodworms to my fish today – I know I touched one of the worms with my hand so I must have made accidental contact. Oops. Won’t be doing that again. My allergic responses have become more severe with handling blood worms. It started with sneezing, coughing, itchy throat and eyes, and now I get welps and bumps where the blood worm have had contact. I held some under the water to soak, and some floated to my upper arm, and I have welps now where they touched. They look like multiple mosquito bites, and are itchy, and white. I hold my breath with handling them, as to not breathe in the dust, and I wash my hands immediately after. But, it looks like I will need to transition to black worm. Or get my significant other to feed the bloodworms. I’ve discovered I’m allergic. I have a Mystus leucophasis that we semi-voluntarily adopted. The only food we’ve found he readily eats is dried bloodworms (and tankmates, but my wife says there won’t be any more of that). I’m allergic to his tank water. If I wash it off in under 15 minutes, it’s just a hint itchy. If I wait too long, it looks like poison ivy. The only cure is to wash with vinegar and let it dry. This is very effective, by the way, so I’m posting here to share that information. If I forget and touch my eye, it’s swollen conjunctivitis and pretty horrible. We’re still experimenting with alternate foods. Just discovered today that I am allergic to these buggers. I also have adverse reactions to midge bites, so I'm guessing therein lies the connection. My eyes went red, swelled up and became intensely itchy, and my nose started running. I've never had a skin reaction, but I must have touched my face shortly after feeding bloodworms to my fish today - I know I touched one of the worms with my hand so I must have made accidental contact. Oops. Won't be doing that again. Bloodworms make the skin on my hand itch. I have to wash my hands thoroughly after handling them to make sure I don't get it in my eyes. Hello, is it possible to share this article ? I am thinking of some fish keeping groups on FaceBook , as this is important . Thanks , Des.